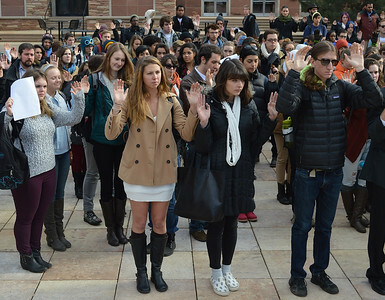 Students at the University of Colorado campus in Boulder gathered for 4.5 minutes of silence in protest of the Ferguson grand jury decision. 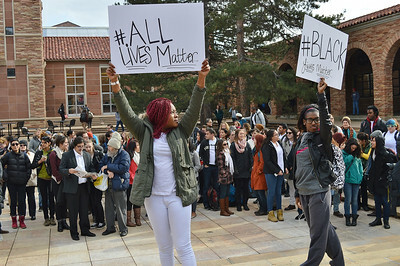 Two young African American women, college students, raise signs above their heads at protest of Ferguson grand jury decision, large crowd of demonstrators in the background. 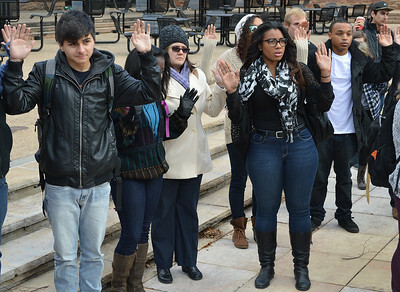 Large group of college students standing together with hands raised in the air, at protest of Ferguson grand jury decision. 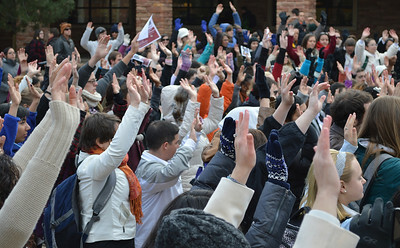 Large crowd of college students, seen from the side, all have hands raised in the air. 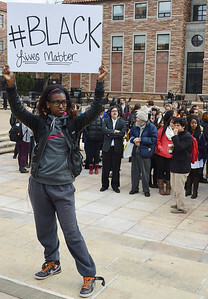 Young African American woman, college student, raises sign above head "#Black Lives Matter", group of demonstrators in the background. 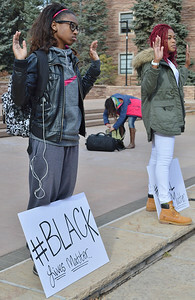 Two young women, college students, with hands raised in the air, at Ferguson protest, sign at one's feetreads #Black Lives Matter". 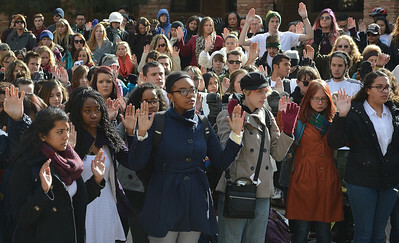 Group of youg women, college students, standing with hands raised in the air, large crowd behind them also with hands raised. 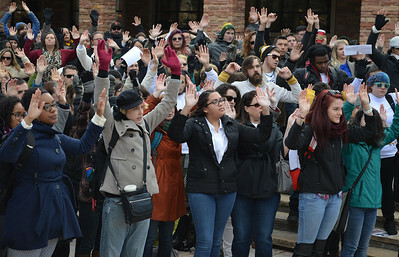 Group of college students raise hands in the air at Ferguson grand jury protest. 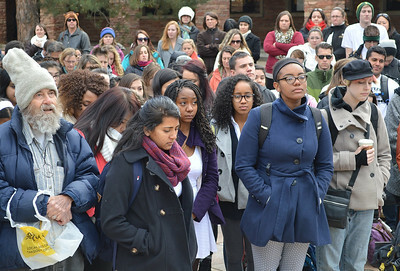 Large group of college students standing together at protest of Ferguson grand jury decision.. next to them older man with grey beard and large hat. 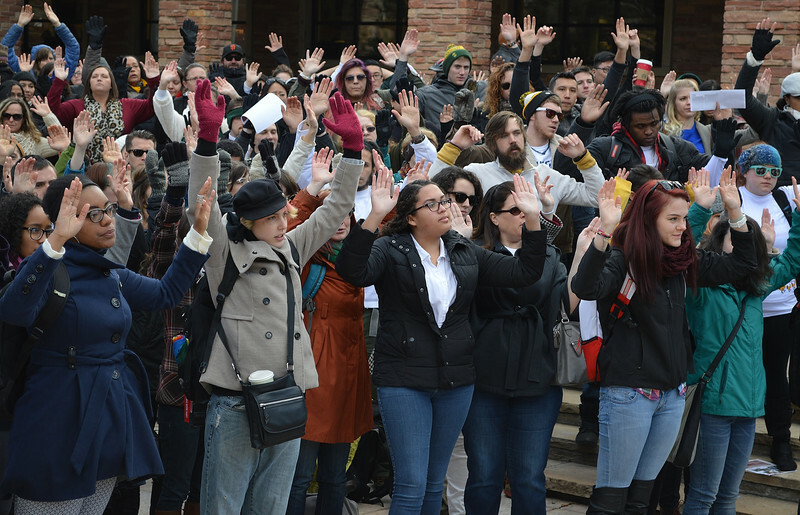 Young woman, a college student, raises hands in the air at Ferguson grand jury protest, other demonstrators around her with hands raised. 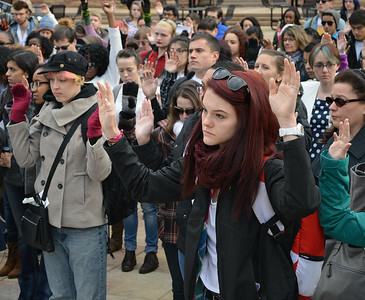 Group of young women, college students, raise hands in the air at Ferguson grand jury protest. 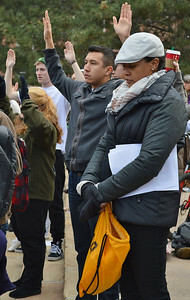 Young African American woman with head bowed, other protesters behind her with hands raised in the air in protest of Ferguson grand jury decision. 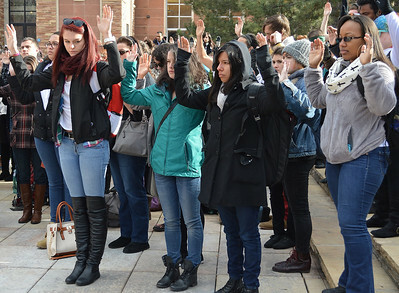 Two young women, college students, standing with hands raised in the air at Ferguson protest. 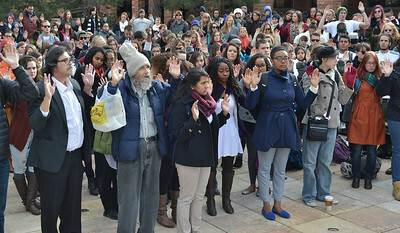 Group of college students, standing with hands raised in the air at Ferguson protest. 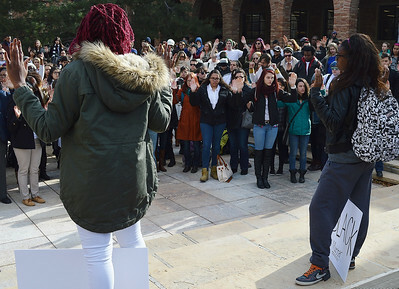 Two African American women standing at front of large crowd of other students, also with hands raised in the air. 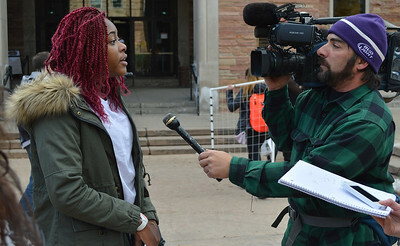 Man with video camera on his shoulder, extends microphone toward young African American woman, a college student, who he is interviewing.